*Includes pictures *Includes contemporary descriptions of Petra *Includes online resources and a bibliography for further reading *Includes a table of contents “Petra, O Leeds, is the most wonderful place in the world, not for the sake of its ruins, which are quite a secondary affair, but for the colour of its rocks, all red and black and gray with streaks of green and blue, in little wriggly lines…and for the shape of its cliffs and crags and pinnacles, and for the wonderful gorge it has, always running deep in spring-water, full of oleanders, and ivy and ferns, and only just wide enough for a camel at a time, and a couple of miles long. But I have read hosts of the most beautifully written accounts of it, and they give one no idea of it at all…so you will never know what Petra is like, unless you come out here… Only be assured that till you have seen it you have not had the glimmering of an idea how beautiful a place can be." - A letter from T.E. Lawrence (“Lawrence of Arabia”) to his childhood friend E.T. Leeds in February, 1914. When the European armies of the Third Crusade were defeated at the Battle of Hattin in 1187 CE, the region of what is today southern Jordan was overrun by Saladin’s armies, and over the following five centuries knowledge of Petra’s existence was lost to the people of Europe. The ancient city and center of civilization hidden in the desert became a myth, drawn largely upon Biblical accounts of the people and places in the Holy Land. However, during the Enlightenment of the early 18th century, interesting new theories emerged, and there grew a desire to rediscover the rose-red city. It was within this context that the Swiss-born explorer and orientalist Johann Ludwig Burckhardt became the known as the first European to “discover” Petra. Disguised as an Arab, he convinced a local guide to navigate him through the innumerable dangers of the Wadi Araba desert in pursuit of the rumored tomb of Aaron and a timeless city hidden in the hills. On Saturday, August 22nd, 1812, he ascended the high hills of southern Jordan and was led down a deep ravine, which twisted and turned through until a splendid sight was revealed before him: a secret valley filled with ruins and the dark holes of rock-cut tombs. Although his disguise had brought him that far, it also prevented him from being able to fully study the ruins or make copies of what he saw there. After spending only a day exploring the valley, his guide had grown suspicious, so he was forced to move on across the Sinai Peninsula, eventually arriving at Cairo on September 4th. This expedition marked the beginnings of everything that is known about this ancient and mysterious site. Further expeditions and archaeological investigations over the following two centuries have considerably broadened knowledge about Petra’s past, and the ruined Rose City is now an archaeological landscape that has been made famous as a UNESCO World Heritage site, a “new” wonder of the world, and as the repository of the Holy Grail in Indiana Jones and the Last Crusade. Yet, despite its fame, many people do not know about the religious beliefs, artistic creativity, technological innovation, commerce, and politics of the numerous peoples that resided there. 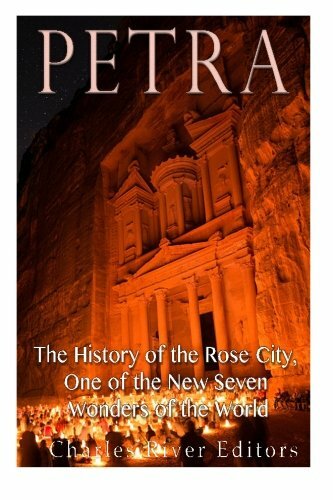 Petra: The History of the Rose City, One of the New Seven Wonders of the World looks at the history of Petra from prehistoric times to the end of the Crusades, as well as the city’s “rediscovery” in the 19th century and how it has entered the world’s imagination since then. Along with pictures depicting important people, places, and events, you will learn about Petra like never before.